The inner hose is made from helically wound stainless steel strip with DELI-LOK profile. A high strength fibre glass cord pulls the inner hose metal corrugations tightly together. The triple layers stainless steel wire braidings provides high resistance against wear, good mechanical resistance together with good protection against electro-magnetic interference. 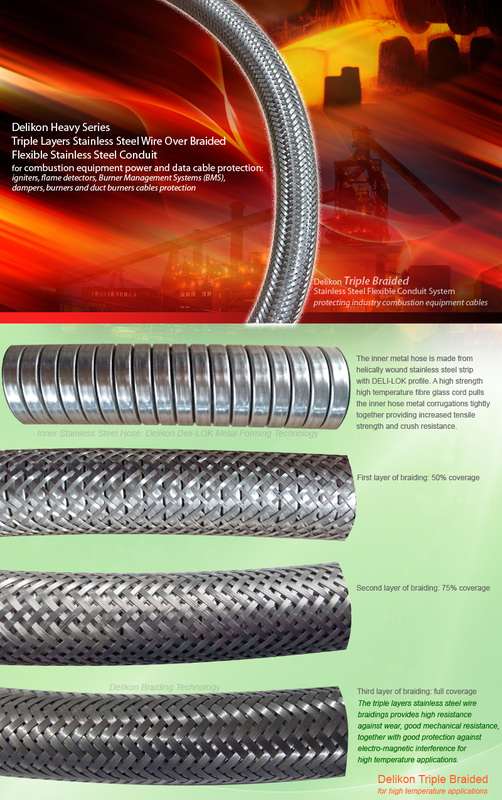 Resistant to most types of fuels, oils and greases, this Heavy Series Triple Braided Flexible Stainless Steel Conduit is most suitable for high temperature applications where a high level of thermal resistance is required, such as industry burner and combustion equipment cables protection. Delikon has maintained its position as a leader in manufacturing the most innovative lines of flexible conduit sytems for power plant and large industrial systems. advanced ratio control through a high degree of precision, repeatability and durability. Delikon heavy series over braided flexible conduitand fittings provide reliable protection of power and data cable for Flow Control Valves, igniters, flame detectors, electrical enclosure and control panels. For safe ignition and control of industrial burners, Delikon heavy series over braided flexible conduit systems also offer protection against electro-magnetic interference of control cables. Combustion Systems & Equipment cable protection. Suitable for high temperature applications.